Have you ever seen tortoises as big as you? Have you ever swum with sharks? Have you ever sat on the beach next to sleeping sea lions? Galapagos makes it possible! The Galapagos Islands emerged around four million years ago as a result of volcanic eruptions. They are located about 620 miles (1,000 km) west of the Ecuadorian mainland. Due to their great biodiversity the islands belong to the UNESCO World Heritage. About 200 years ago Charles Darwin explored the Galapagos Islands and was fascinated by the many different and unique animals you can find here. If you go to Isla Isabela during your trip – one of four inhabited and the largest of the Galapagos Islands – you get the chance to see the Galapagos penguins. It is the only place in the northern hemisphere where penguins can be found. But that is not all: on Isla Santa Cruz live incredibly huge tortoises in the highlands and at Tortuga Bay. Tortuga Bay is a long, beautiful, white sandy beach. You have to watch your feet to not stumble over the numerous marine iguanas which are lying there like rocks. On Isla San Cristóbal you can soak in the peaceful, relaxed island atmosphere while strolling down the waterside promenade. But watch out: before sitting down on a bench, make sure it is not occupied by one of the original inhabitants of the island – a sea lion. You will find these cute animals everywhere, on the benches, on the beach, in the streets. The Galapagos Islands has many uninhabited islands and islets. Some are permitting visitors and can be reached during a cruise or, if they are close enough to Santa Cruz, during a day tour. Each island has its own unique beauty and features animals that sometimes can be found only on this one island such as the Galapagos Albatross. The Santa Fe land iguana is one such example, as it only lives on the tiny island of the same name. Of course not just the animals on land are worth to be mentioned. Really impressive is the underwater world that holds at least as many surprises as the Islands themselves. Snorkeling or diving are experiences you definitely should not miss during your trip to Galapagos Islands. “Los Tuneles” at Isla Isabela and “León Dormido” – also known as “Kicker Rock” – at Isla San Cristóbal are excellent places for spotting sea turtles, sea lions, starfish, sea horses, rays, blow fishes, and, if you are lucky, also sharks. Every island has its own extraordinary flora and fauna and invites you to different activities like snorkeling, birdwatching, hiking or cycling. 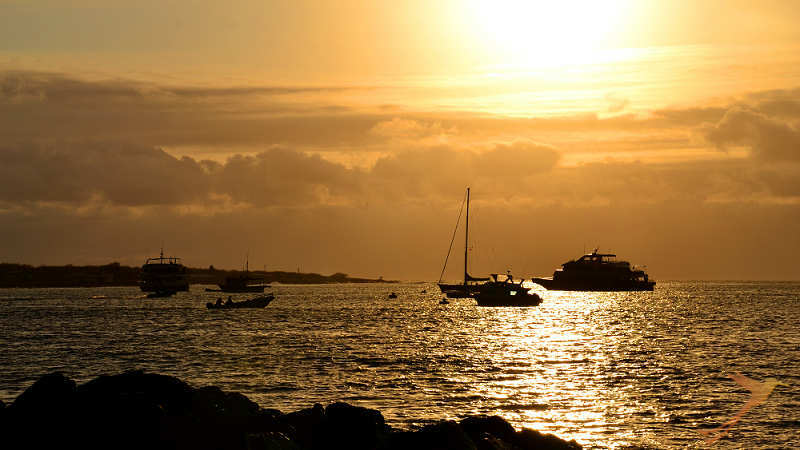 In the evening watch the amazingly beautiful sunset at one of the Galapagos Islands, with the sea lions by your side. Or just sit down in a bar on the beach, cover your feet with sand, listen to the sound of the waves, stare into a bonfire, reminisce about the day’s experiences, let your thoughts wander, and be grateful for being able to spend a few days in this little part of paradise. Do you also want to spend a night or more in paradise? Check out our various Galapagos Tours. Sounds like these islands just hopped out of my dreams and onto this beautiful planet!